What is Soft VitaChews For Cats? 1-800-PetMeds Soft VitaChews For Cats are a complete multivitamin and mineral supplement with taurine, digestive enzymes, and Omega 3 -- great for your cat's health. 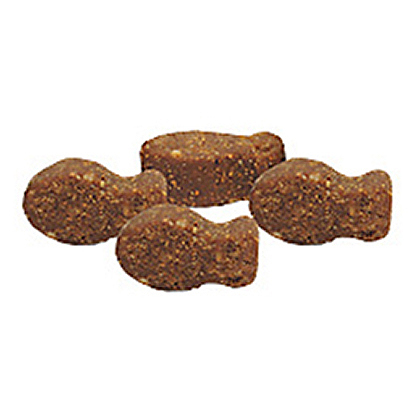 They are an easy-to-give and easy-to-eat soft chew in a delicious chicken liver flavor that cats love. Made in the USA. As a complete multivitamin and mineral supplement, it not only ensures that your feline will get the basic nutrition needed to stay healthy, but also other ingredients, such as taurine, that are particularly important for good health. Methionine (10 mg), Cystine (5 mg), Linoleic Acid (25 mg), Calcium (50 mg), Phosphorous (25 mg), Potassium (0.25 mg), Magnesium (1.5 mg), Iron (1.5 mg), Copper (0.030 mg), Zinc (1 mg), Iodine (0.040 mg), Selenium (0.0035 mg), Vit. A (900 IU), Vit. D3 (50 IU), Vit. E (5 IU), Thiamine (Vitamin B1) (2 mg), Riboflavin (Vitamin B2) (2 mg), Pantothenic Acid (5 mg), Niacin (5 mg), Pyridoxine Hydrochloride (Vitamin B6) (2 mg), Folic Acid (0.002 mg), Biotin (0.002 mg), Vitamin B12 (0.002 mg), Choline (5 mg), Taurine (200 mg), Ascorbic Acid (Vitamin C) (20 mg), Inositol (2 mg), P-aminobenzoic Acid (2 mg), Betaine Hydrochloride (10 mg), Lecithin (5 mg), Bromelain (Pineapple) (0.38 GD Units), Lipase (Pork Pancreas) (1.08 USP Units), Pepsin (Pork) (2.55 NF Units), Papain (Papaya) (1.7 USP Units), Eicosapentaenoic Acid, EPA (from fish oil) (8.2 mg), Docosahexaenoic Acid, DHA (from fish oil) (5.5 mg). 1-800-PetMeds Soft VitaChews for Cats is a chicken liver flavored complete multi-vitamin/mineral combination with Taurine, Digestive Enzymes and Omega 3. 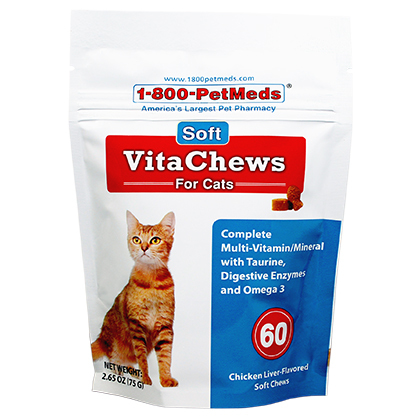 1-800-PetMeds Soft VitaChews for Cats is non-prescription (OTC) product available as 2.65 OZ (75 gm) pouches containing approximately 60 soft chews. 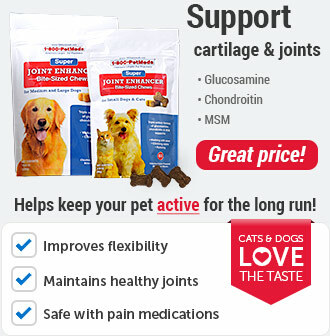 For adult cats give 2 soft chews daily divided between AM and PM. For kittens give 1 soft chew daily. 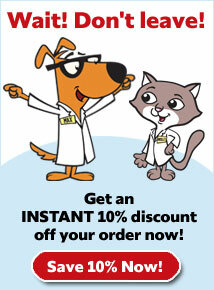 1-800-PetMeds Soft VitaChews for Cats is intended as a supplement for animals only. 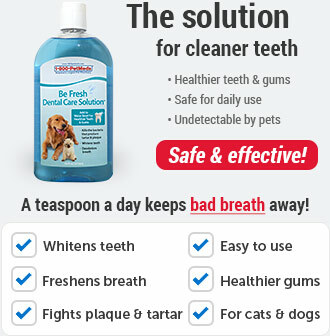 Some pets may consider this product as a treat. Keep out of the reach of pets. Some pets may consider this a treat. In case of accidental overdose, contact your veterinarian or veterinary emergency room. Store tightly closed in a cool, dry place. Keep out of the reach of children and pets. 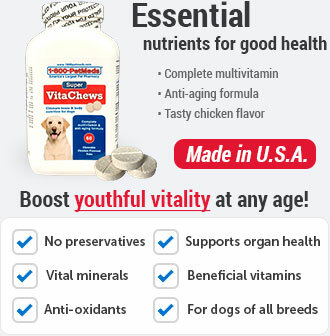 1-800-PetMeds Soft VitaChews for Cats is a chicken liver-flavored complete Multi-Vitamin and Mineral supplement. 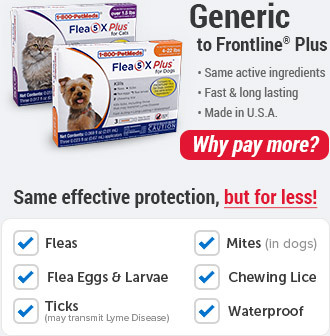 1-800-PetMeds Soft VitaChews for Cats should not be given to dogs. 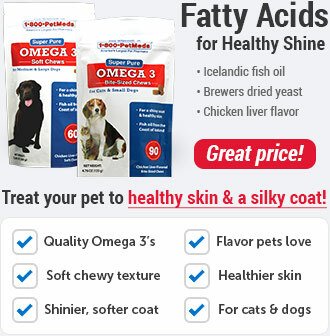 1-800-PetMeds Soft VitaChews for Cats contains Taurine, Digestive Enzymes, and Omega 3. Other Ingredients: Natural chicken liver flavor, brewers dried yeast, glycerin, taurine, dicalcium phosphate, lecithin, dried whey, canola oil, I-ascorbyl-2-polyphosphate, calcium carbonate, safflower oil, fish oil, maltodextrins, sodium alginate, calcium sulfate, choline chloride, betaine hydrochloride, dl-methionine, vitamin E supplement, iron proteinate, zinc proteinate, calcium pantothenate, cystine, niacinamide, bromelain (from dried pineapple), magnesium oxide, riboflavin, pyridoxine hydrochloride, thiamine mononitrate, p-aminobenzoic acid, inositol, vitamin B12 supplement, vitamin A acetate, propionic acid (a preservative), mixed tocopherols (a preservative), potassium chloride, pork pancreas (source of lipase and protease activity), copper proteinate, sodium selenite, vitamin D3 supplement, biotin, calcium iodate, folic acid, pepsin (pork stomach), papain (from papaya). **One GD unit of protease activity will liberate approximately 8.4 mg amino acids (from gelatin)/20 min/mg of enzyme at 45 C and pH 4.5. ***One USP unit is the activity that liberates one microequivalent of fatty acid under standard conditions. ¹One USP unit of protease is contained in the amount of protease that digests 1.0 mg of casein under standard conditions. ²One NF unit of pepsin activity digests 3000 times its own weight of coagulated egg albumen under standard conditions. ³One USP unit of papain activity will liberate 3.0 mg amino acids (from egg albumin)/min/mg of the enzyme under standard conditions.